PRICE REDUCED!! -Negotiable- The time has come for me to pass this extraordinarily unique car off to someone who appreciates originality, auto history, and extraordinary beauty and styling. Originality: This car has garnered a Bloomington Gold Certified “Survivor” and 3 National Corvette Restorer Society’s “Top Flight” distinctions earning a near 97 out of 100 score. Two of the NCRS Top Flights were earned at Regional meets with national “Bow Tie” recommendations. All the judging evaluation sheets will be provided to the buyer along with the awarded Certificates. Also, the new caretaker will be provided with the original GM paperwork such as; the Window Sticker, Owner's Manual, Dealer Prep Sheet, Warranty Information Booklets, Sales Brochure, etc. This car has been maintained to all NCRS originality and condition standards and has won numerous Corvette Show awards. Awards: 1982 Feature Corvette at the GM 100th Anniversary Celebration – Sept. 16, 2008 Bloomington Gold Survivor in 2009 Chapter NCRS Top Flight Award in 2009 scoring 97.8 Regional NCRS Top Flight Award in 2010 scoring 96.1 Regional NCRS Top Flight Award in 2013 scoring 96.9 Corvettes on the Square “Gold Award” in 2007 & 2009 Knoxville Corvette Club “Class” Winner 2014 & 2016 Tri Cities Corvette Club “Class” Winner 2015 During my tenure all 4 brake calipers have been rebuilt, new Goodyear GT-II tires, new GM shocks all around, GM front springs installed, DELCO battery, and bumpers repainted. The OEM shocks and springs, plus additional parts, some very hard to find, will go to the buyer. History: This particular car is 1 of 723 in 1 year only Silvergreen paint with matching leather interior. It was built in Bowling Green, Kentucky during the third week of July, 1982. It was delivered to Sunderland Chevrolet in Lemoyne, PA in August. With only a few weeks left in the production run, it is literally one of the last produced C3s. Three previous owners meticulously maintained this low mileage car. I have owned it for more than 14 years driving the car 7,587miles. Currently, there are 16,923 miles on the odometer. This car was also selected by the National Corvette Museum to represent the 1982 model year on the Museum’s Motorama II tour. One car was chosen to represent each model year produced through 2008. The Motorama II was a 9 day tour of museums and display events in Missouri, Illinois, Indiana, and Michigan. On September 16, 2008, this highly original 1982 Corvette was featured on the on the fountain display area outside General Motors Headquarters on their historic 100th Anniversary. It was selected to represent the last model year of C3s, the famous and longest running generation of Corvettes. PowerTrain: 1982 would mark the last of a generation of Corvettes with big fenders and a chassis dating back to 1968. By 1982, Corvette was beginning to rebound from the performance limitations of the ‘70s on the strength of a whole new drive train. The chief innovations were the all-new Cross Fire Injection system paired with the new 700R4 automatic transmission. All models (25,407 units) were produced with this new engine that was originally slated to debut in the delayed new 1983 models. Still displacing 350 CI, the new powerplant boasted a freshly developed fuel-injection system using a separate throttle body for each cylinder bank. Advertised as Cross-Fire Injection, the new system improved throttle response and fuel economy and gave the 350 a slight boost in power to 200 HP. Additionally the new engine, dubbed L83, used tubular exhaust headers, computerized emission controls and magnesium valve covers. 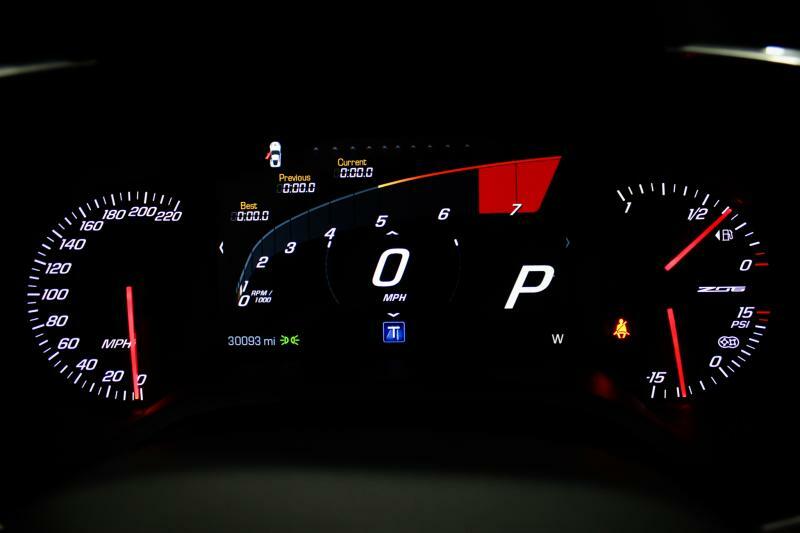 The 700R4, a 4-speed automatic with a computer-controlled torque converter and overdrive took fuel-metering controls to a new level of sophistication. See Window Sticker photo for equipment list.